In this Sept. 21, 2016 file photo, EpiPens brought by Mylan CEO Heather Bresch are seen on Capitol Hill in Washington as she testified before the House Oversight Committee hearing on EpiPen price increases. Brenda Thiel and Alyssa Wachtler live on opposite sides of the country. But they've got at least one thing in common: both have sons with severe nut allergies. And when they made their usual back-to-school trips to the pharmacy to procure their EpiPens for the new year, they were told the same thing. "The pharmacist literally walked up to me and said, 'I'm really sorry, we do not have any epinephrine here,'" Thiel, who lives in Tucson, Arizona, told CNBC. "He said there's a shortage, and you're not going to be able to find EpiPens anywhere." The lifesaving allergy medicine has had manufacturing disruptions since May, but allergy sufferers and caregivers may find it especially hard to find now, as parents try to stock up to send their kids back to school. EpiPen prescriptions typically spike in August, when parents buy multiple packs to give to their kids' teachers, nurses and sports teams. "In my busy pediatric clinic, we've noticed there are a number of patients calling in wondering where they can procure their EpiPens, since most pharmacies are having trouble keeping them in stock," said Dr. Stacy Dorris, of the department of pediatric allergy and immunology at the Vanderbilt University Medical Center in Nashville, Tennessee. It's a problem across the country. CNBC called two dozen pharmacies, from Boston to San Francisco, and nearly each one said it had no EpiPens, or very few, in stock. Some said the back-order date keeps getting pushed back, while others said it wasn't clear when more would be made available. 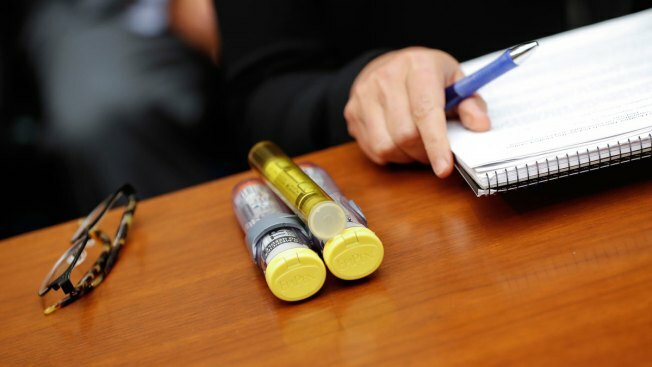 Patient advocacy group FARE, or Food Allergy Research & Education, said it heard from 600 people in 43 states in a survey about EpiPen availability, and more than 80 percent indicated they either couldn't fill or could only partially fill their prescriptions. "It's clearly a headwind," Maris said. "And no one's talking about how soon it will be cleared up." New Jersey-resident Wachtler, whose 6-year-old son, Hudson, is starting first grade this year, is among parents who struggled to secure an EpiPen. She said she had to call eight to 10 local pharmacies before she found one that had a set of EpiPens in stock that were covered by her insurance. "I said, 'Put it on hold! I will be there in the morning!'" Wachtler told CNBC. "And I rushed over and got the last box." While EpiPen is marketed by Mylan, it's manufactured by a subsidiary of Pfizer. Mylan says it's "exploring several options with Pfizer that would help stabilize supply," while Pfizer cites "delayed shipments due to process changes," and the supply of "third-party components" for the disruptions. The Pfizer subsidiary, Meridian Medical Technologies, received a warning letter from the Food and Drug Administration in September, citing "significant violations of current good manufacturing practice requirements" at its Missouri plant. Pfizer spokesman Steven Danehy said that the warning letter didn't restrict supply at the time it was received, but that "there has been some impact on manufacturing capacity" as a result of new processes it put into place to fix the issues the FDA cited. The EpiPen isn't the only option for allergy sufferers, though it is by far the most dominant. There is an identical authorized generic version also sold by Mylan, but at half the price, but it too faces manufacturing issues. Amneal Pharmaceuticals makes the Adrenaclick, a similar epinephrine auto-injector, while private drugmaker Kaleo makes the Auvi-Q, a smaller, rectangle-shaped device that talks the user through how to use it. The Adrenaclick faced its own manufacturing issues earlier this year, but Amneal spokesman Mark Donohue said this week that the epinephrine auto-injectors are available. The Adrenaclick is also made by Pfizer, he said. "While we experienced intermittent supply of products from our third-party manufacturer throughout the second quarter and during the month of July, we are receiving shipments," Donohue said. The Auvi-Q hasn't had similar manufacturing problems, but it has another characteristic that may make it hard for some patients to procure: a list price of $4,500 for two auto-injectors. If it's covered by insurance, many can get the device without a copay. But it's not always covered. That was the case for Thiel. Her 12-year-old son, Dylan, just started seventh grade, and is carrying his own epinephrine auto-injector for the first time. After fruitlessly calling multiple local pharmacies to try to find the EpiPen, Thiel said she asked her pediatrician to write a prescription for the Auvi-Q. But her insurance, provided by the government as her husband has retired from the military, doesn't cover it. Finally, after an appeal, Thiel said the insurer agreed to cover it just one time. "This has been about a month of me calling and asking and trying to get help," Thiel said. "Just trying to make sure I can have his medicines for him to go to school." Back in New Jersey, Wachtler said she could also get the Auvi-Q, but that the staff members at her son's school aren't trained on how to use it. "I feel most safe sending my son to school with the EpiPen or the EpiPen generic, knowing that the faculty is trained in how to administer that medication in case of an emergency," Wachtler said. Mylan supplies EpiPens to schools through its EpiPen4Schools program. But even that system may face delays in supply, Mylan spokeswoman Lauren Kashtan said. It's unlikely, though, that the new competitor will solve the problems parents are facing as they send their kids back to school. Teva said in a statement that it's applying its "full resources to this important launch in the coming months." It didn't specify a launch date, or a price. Meanwhile, Vanderbilt's Dorris notes that in a bind, recently expired EpiPens can be used in an emergency situation, though it's not recommended if nonexpired products can be obtained. And she stressed that, though many may feel concerned about their ability to obtain an EpiPen, it's not a good idea to hoard them. "On each epinephrine auto-injector, there is an expiration date," Dorris said. "If it's not expiring soon, it's probably best to wait and not rush the pharmacies right this moment. Give people time and space to get the epinephrine auto-injector they need for school." "It's something just as a culture, as Americans," she concluded, "we need to do for each other right now."